Bring chicken broth to a boil in a saucepan. Turn off heat and set aside. Heat butter and olive oil in a large, shallow saucepan over medium-high heat. Add the onion, reduce heat to medium and cook 5-6 minutes or until beginning to soften. Stir in the garlic, cook briefly (15 seconds) or until fragrant. Stir in mango, buttermilk and Parmesan cheese. Season to taste with salt and black pepper. Melt butter and jalapeno in a saucepan over medium-high heat. Reduce heat to medium and cook until a caramel color, approximately 5 minutes, being careful not to burn it. Set aside to let browned bits fall to the bottom of the pan. Heat olive oil in a nonstick skillet over medium high heat. Season sea scallops with salt and black pepper to taste. Place scallops in the pan and cook 2-3 minutes per side or until nicely browned, being careful not to overcook. To serve: Place risotto on a plate. Top with shaved Parmesan cheese. 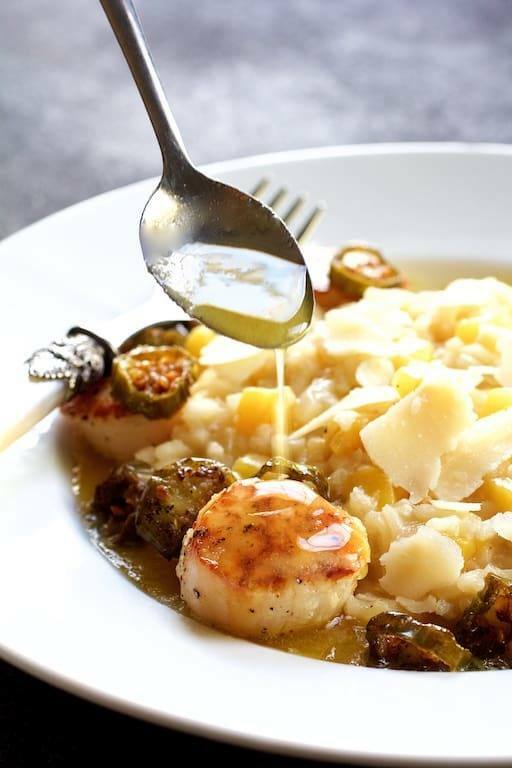 Place scallops around risotto. Carefully pour browned butter over scallops, leaving browned bits behind. Serve immediately.